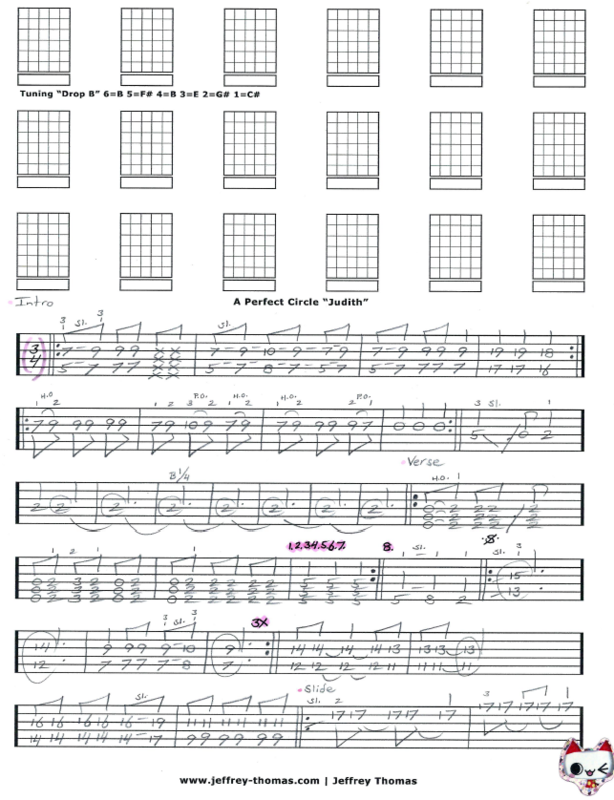 A Perfect Circle Judith Free Guitar Tab by Jeffrey Thomas. This tab will show you the tuning, song structure and how to transition from the lead to rhythm parts all arranged for one guitar. I also have the slide parts notated so you can learn this tune just like the recording. Want the full guitar tab for free? Just send in your email using the form provided. Looking for online guitar lessons? Fill out the Schedule A Free Lesson form to set up your free Skype guitar lesson today! This tune was recorded from start to finish in just one take! I hope you enjoy checking out the free guitar tab for page one and remember there is a free Skype lesson included with purchase of the full song. Check out more free guitar tabs in my tab, video and blog pages.